On the 9th of April 1940 German forces started the invasion of Norway. On the 1st of May the Germans had captured the southern part of Norway. Up north the situation was different. The Germans lost the battle of Narvik fighting against British, Polish, French and Norwegian Forces. 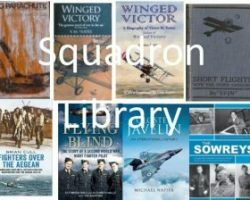 There then followed one of the most notable periods of No 46 Squadron’s history. Then, on 9th May, orders were received to embark the Squadron in the carrier HMS Glorious. During the next two days their Hurricanes were hoisted aboard the carrier. On the 12th, Glorious sailed only to be recalled. No airfields in northern Norway were ready to receive the fighters yet. No 46 Squadron’s ground crews and advance party embarked in the troop carrier Batory in Glasgow on 13th May, and on the following day Glorious sailed again. HMS Furious, carrying No 263 (F) Squadron and its Gloster Gladiators, also set course for Norway. On the 21st, the carriers entered their fly-off position outside Lofoten. Furious then flew off her Gladiators, which landed at Bardufoss, but Skånland was still not ready for the Hurricanes. The carriers withdrew from Norway, and Glorious arrived Scapa Flow on the 23rd, refuelled on the 24th and sailed again the same afternoon. On the 26th, the landing strip at Skånland was finally reported ready. At 0830 on 26th of May Squadron Leader Kenneth Cross took off from Glorious in his Hurricane P2632. This was the first Hurricane to take off from a carrier. Since Glorious did 30 knots the take-off was not a problem for Cross nor the rest of the Squadron that all departed Glorious that evening. Already in April, the Air Ministry in London ordered RAF to establish a force, “Force V, to give air-support to the Norwegian campaign. Squadron Leader Kenneth “Bing” Cross, commander of No.46 (Fighter) Squadron, was told that the Air Ministry intended to send his squadron of Hawker Hurricane Mk1 fighters to Andalsnes. However, with the Allied evacuation of central Norway, the plan was abandoned a few days later. In three formations they set course from Skånland west of Narvik. Each formation was led by a navigating Swordfish. The runway at Skånland consisted of 700 metres of steel-meshed “sommerfelt” tracking laid on bare earth. Cross landed first. On the roll-out the wheels on his Hurricane started to sink into the too soft earth and the plane tipped over bending the propeller blades. There followed two successful landings, but then Flight Lieutenant Stew-art tipped over and ended up inverted. Stewart was unhurt but his Hurricane was damaged beyond repair on site. After two more landings Cross ordered Flight Lieutenant P.G “Jamie” Jameson to continue with the remaining eight Hurricanes onwards to Bardufoss, which had solid earth runway. At Bardufoss all planes landed safely although one of them overshot the short runway and ran a few yards into the scrub. Early next morning Cross led three Hurricanes off from Skånland in the Squadron’s first scramble. Actually only two got airborne. Pilot Officer Bunker tipped over on the take-off due to the soft earth. The patrol did not make con-tact with German planes. Cross now decided to evacuate Skånland and after flying a patrol, all planes landed at Bardufoss. Cross flew his own Hurricane, having been able to straighten the bent propeller. In the evening, 46 Sqn. had 15 of its remaining 16 Hurricanes operational at Bardufoss. From 0730 and through the night 46 Sqn flew patrols over Narvik to give cover to an allied attack. They did not sight any German planes. At 00:41 in the morning they had to stop flying due to fog at Bardufoss. At that time Ju 88’s and He 111.s from Trondheim arrived in the Narvik area and did a lot of damage to Royal Navy ships. Later in the morning the weather at Bardufoss improved and 46 Sqn flew 15 missions that day. Now they made con-tact with the enemy. Flying Officers Mike Mee and Jack Lydall attacked two Ju 88s over the Ofotfiorden west of Narvik. Lydall was able to shoot one of them down. Three 3 3 Hurricanes, led by Jameson, attacked two water-borne Dormer Do 26 flying boats, hidden in a small cove in the Rombaksfjord east of Narvik. After four attacks both Dorniers were ablaze and sinking. At 00.40 on the 29th (still light at that latitude). Jameson and his wingman Pilot Officer Jack Drummond shot down one He III each over the Ofotfiorden although Oberleutnant Egon Schmidt managed to crash-land the aircraft hit by Drummond in Swedish territory. Drummond’s Hurricane was hit by return fire and he had to bail out, and was picked up by the destroyer HMS Firedrake. In the afternoon of 24th May, Pilot Officer Banks attacked and shot down a FW 200 Condor bombing Tromsø. The stricken aircraft fell at Dyrøy. In the evening, Lydall was able to shoot down a He 111, it made an emergency landing at Andøya. Probably hit by return fire from the Heinkel, Lydall had to make an emergency landing. He crash-landed in a small marsh on the western slope of Tjeldøy. The Hurricane turned over on its back and Lydall was not able to get out. A small fire started, and Lydall feared that he would be burned to death. He managed to throw a few private letters some metres away onto the snow. The fire died out before it reached the cockpit. When people finally arrived at the scene of the crash, perhaps as much as one hour later, Lydall was dead from wounds and exposure. Nearby, and at about the same time, Pilot Officer Neville Banks also attacked the Heinkels. He probably managed to shoot one Heinkel down. However, his Hurricane was severely damaged by bullets from one or more Heinkels. He tried to make an emergency landing in a marsh a few miles north of Lødingen. Unfortunately, he landed short; in a small river, and the Hurricane hit large stones. The stop was abrupt and Banks was thrown out of the cockpit and hit a birch. He died instantly. The same evening Flt Sgt Shackley shot down a Me 110, his cam-era gun filming continually as the German went down to crash. On the 30th, the weather was too bad for any flying. The next day weather improved and the Squadron flew several missions over Harstad, Skånland, Bardufoss and Narvik. Late in the evening two patrols flew all the way south to Bodø to cover the evacuation of that town. Meanwhile orders had arrived to evacuate Narvik. On the 31st Glorious and HMS Ark Royal sailed from Scapa Flow to -cover the evacuation planned for the 2nd of June. On that same date 46 Sqn flew 17 missions without enemy contact. That day the Squadron was visited by Crown Prince Olav of Norway (later King Olav V, who presented the Squadron Standard in 1979) and Captain Ole Reistad, Acting CO of the Royal Norwegian Army Air Force. On 1st of June fog: prevented any flying. Late on the 2nd of June the weather improved and Luftwaffe bombed and destroyed most of Narvik town. 46 Sqn. flew 18 missions and made contact with the enemy. Plt Off Drummond and Sgt Taylor took off from Bardufoss at 12.30 and immediately attacked two Ju 87s. Taylor’s victim smashed onto rocky around, while the Stuka hit by Drummond crash-landed to the south-cast of Narvik. Pilot Officer Jack Frost in L 1815 and Sergeant Tyler in P2632 at-tacked a Junkers Ju 87. Frost received a bullet in his windshield, which shattered, but stopped the bullet. The Ju 87 was lucky to escape among clouds. Pilot Officer Bunker and Sergeant Shackley engaged five BF 110s from Zerstorër Gruppe (Z.G.) 76. One of the Messerschmitts was damaged and force-landed on its return towards Trondheim. The next few days 15.000 troops evacuated Narvik. No 46 and 263 Sqn. flew cover, but most days bad weather gave the best protection. Since the Hurricanes were not equipped to land on a carrier, order came for them to be destroyed. Cross flew in a Walrus out to the carrier on the 5th and received permission to try and land the Hurricanes on Glorious instead of leaving, them as wrecks at Bardufoss. On the 6th, two Hurricanes escorted five of No 701 Squadron Walruses on a bombing sortie in the neighbourhood of Sørfold. The last day at Bardufoss, the 7th of June, was hectic. Fg Off Knight and Plt Off Drummond took off at 03.40 a.m. and shortly after engaged enemy bombers over Narvik, claiming one each. Sqn Ldr Cross and Plt Off Lefevre scrambled ten minutes later and reported attacking four more Heinkel 111’s over the airfield, claiming one shared between them. Return fire damaged Cross’ Hurricane and he had to land back at Bardufoss. Of course, the Fleet Air Arm pilots were trained to cope with this by doing a fairly steep approach, thereby keeping above the down-draught. Anyway all three of us man-aged to get down all right and no one used more than three-quarters of the deck. “. Shortly after, seven more Hurricanes landed together with ten Gladiators from 263 Sqn. The Commander of Glorious was Captain Guy D’Oyly-Hughes. He was in a hurry to get home to start making preparations for a court-martial against his Commander Flying. He received permissions to part company from the rest of the naval force and proceed to Scapa Flow escorted by two destroyers, leaving Ark Royal and her screen of destroyers behind. For unknown reasons Glorious did not use its Swordfish planes to patrol ahead and on the flanks. Glorious was intercepted and sunk by the battle-cruisers Scharnhorst and Gneisenau 200 miles of the Norwegian coast just north of the Arctic Circle. The destroyers were also sunk. Out of a total of over 1500 men only 41 survived. Jameson and Cross survived three days on a float before being rescued by a Norwegian ship. The sinking of Glorious and her escorts was one of the greatest (and least discussed) naval disasters of the Second World War.. An excellent documentary, The Tragedy of HMS Glorious, was shown on ITV in 1997; click here to view. Th only memorial to the disaster is a beautiful stained glass window in St Peter Parish Church Martindale near Ullswater in the Lake District. 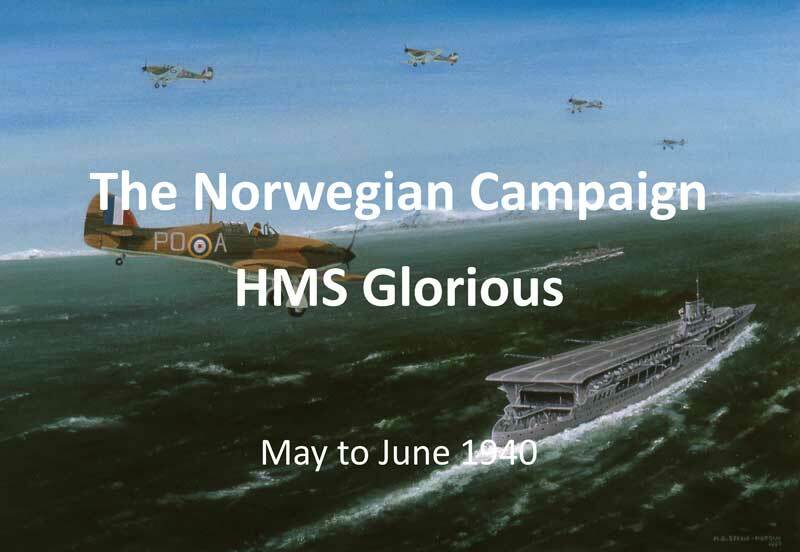 In their ten day Norwegian campaign No 46 Squadron. flew 330 hours and 240 missions. They lost two of their 23 pilots in combat. Eight more pilots lost their lives in the Glorious tragedy. Three Hurricanes were shot down and three left behind at Bardufoss. The two damaged planes at Skånland were salvaged and brought home by ship. 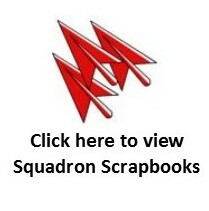   RAF Operations Record Book, Forms 540 and 541 of No 46 Squadron.   “FLYALARM” by Ulf Larsstuvold, Bjorn Olsen, Bjorn Hafsten and Sten Stenersen.   Interviews with locals in the Narvik area.   “Straight and Level ” by ACM Sir Kenneth Cross with Professor Vincent Orange.   “Carrier Glorious ” by John Winton.